With the increasing awareness of the harmful effects of too much sun, Snoebee are frequently asked for a Wide Brimmed Fishing Hat... well here it is. Baseball caps are fine, but offer little protection to the ears and back of the neck. Snowbee's hat solves that problem in a stylish & practical way & is treated with an anti-UV agent for maximum protection. When Snoebee sent the material sample to the SGS Laboratory for testing, it went off the scale! It actually came back with an ‘actual’ UPF (Ultra-Violet Protection Factor) of 2569 allowing just 0.03% of UVA and 0.04% of UVB to pass through! Unfortunately, the ‘official’ rating system only goes up to a factor 50%2B…the equivalent of wearing Factor 50 Sunscreen, so Snoebee had to settle for this! Made from a tough 10oz Cotton Duck material, which breathes naturally for summer coolness. Treated with DuPont Teflon for water resistance, this hat will also keep you dry in a downpour. Complete with an adjustable chin-strap for windy conditions, which can be tucked away inside the hat with a neat Velcro strap. Has a second Velcro pocket inside the hat crown for fishing licence etc. Hat sizes are given in INCHES which is the “head diameter”. To measure your size, use a tape measure & measure the circumference of your head, loosely, running the tape just above the ears and approx. 1” above the eyebrows. Then refer to the chart below for your correct size. A great hat and one that will be well used in the garden on hot sunny days. It would have been useful to have had some washing instructions but I guess that a normal wash should be OK.
Bought as a gift and it was well received. Looks good. Fit was good one size up. He will be using it for summer fishing. check head size before ordering the sizing appears a little on the small side. Hat looks as in picture very pleased. Excellent hat. I need to keep out of the sun as much as possible for health reasons. 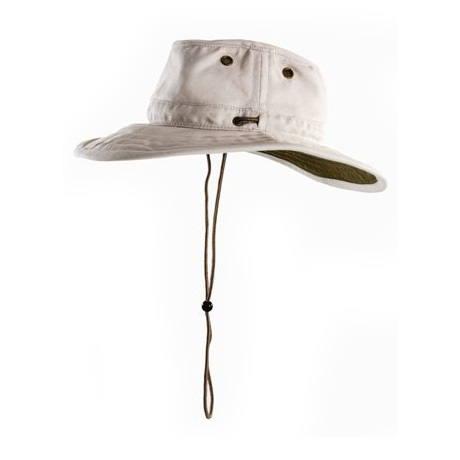 The brim really is wide and will be a great sun protector. Extremely well priced too.Very happy with my purchase.